I’ll admit that I don’t understand a lick about fantasy sports: So you get together with your friends and invent make-believe teams? Then you trade your players in such a way that you effectively rip off your buddies? And you have to pay money for the privilege? What’s the difference between that and, say, playing Barbies? I mean, on the one hand, you have a pastime in which lonely children make playthings of little plastic human simulacra. On the other, you have something that doesn’t involve Derek Jeter. But if I were a marketer, I’d do my damnedest to try and grasp this stuff, because as Good and Column Five Media show, the folks who play fantasy sports are an extremely attractive bunch. They account for $800 million, or about 18%, of the $4.5 billion sports industry. They’re affluent sports fans (players earn $60,000 to $100,000 a year) who are more likely than non-playing fans to spend their salary on everything from beer to sports magazines to airlines tickets. An estimated 32 million of North Americans ages 12 and older compete in fantasy leagues, a 60% increase since 2007. 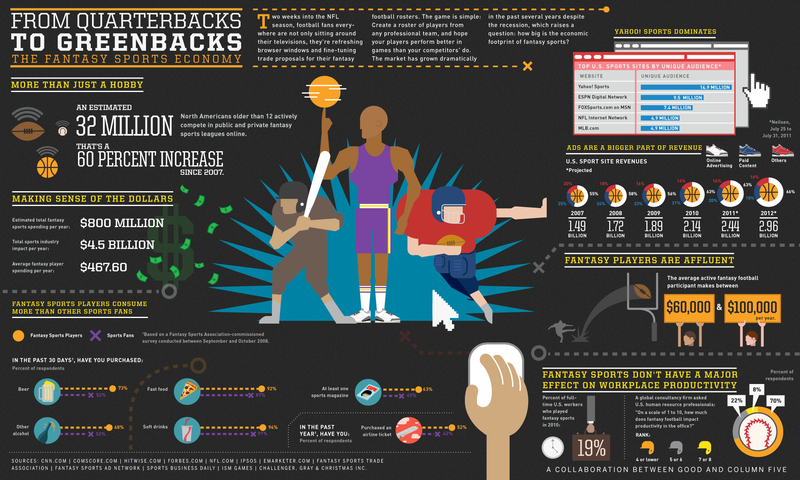 The infographic also suggests something interesting about sports journalism: In a way, fantasy sports now subsidize sportswriting. The site that draws the most unique readers, Yahoo! Sports, also happens to be the top destination for fantasy leagues. Take away all those eyeballs, and you think an online sports outfit would still invest many months and untold dollars in an exposé of a renegade football booster? Doubt it. Maybe there’s a lesson here for other media entities: There’s good money in giving grown-ups a place to play with their dollies.